Interest rates and the direction in which they are heading have important messages for investors as they indicate the changes that may take place in various investments. In short, rising rates mean that fixed assets will decrease in value while falling rates will result in fixed assets value increasing, assuming all other elements remain fairly static. 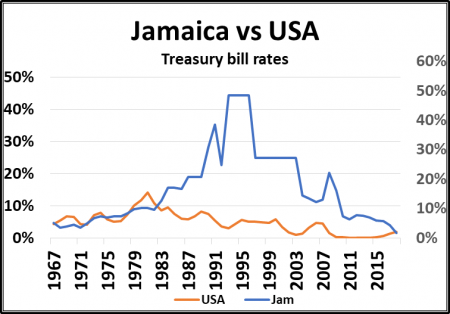 Jamaica has seen a long period of excessive interest rates and bouts when the rates fell below the rate of inflation by a wide margin. When real interest rates were excessively low as in the 1983 to 1984 period and 1991 to 1993, the local dollar came under major pressure and lost much of its value. When the rates went excessively high between 1993 to 2004 it resulted in major dislocation and mayhem in the economy. The latter was the period when the financial system collapsed. After 2005, real interest rates were mostly positive against the United States rates. This period was one of the more stable for the value of the local dollar even when there were some periods when the currency lost value due to real negative interest rates. Treasury bill rates are now below 2 percent, it is likely to provide negative returns for some investors and with rates in the United States rising, this position is unlikely to remain at these low levels for too long. Many investors are focusing currently on extracting attractive gains from the local stock market and real estate investments, this may stave off increased interest in US dollar investments for a while. 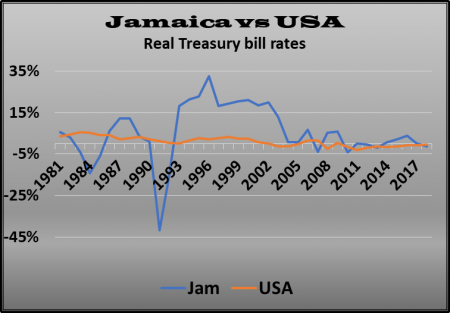 The chart shows that there need not be a huge premium for local Treasury bill rates over those in the US, see the period on the chart from 2005 on wards. With interest rates at current low levels, investors have been revaluing stocks by increasing the Price Earnings ratio they are prepared to pay for them. The trend in interest rates locally is worth watching to see where they could be in 2019 and what if any impact they may have on asset values going forward.